The port of Palamós, managed by the public company, Ports de la Generalitat, is located in a leading tourist, commercial and fishing town, called Palamós with a privileged situation in the heart of the Costa Brava. Palamós port is on one of the deepest bays in the western Mediterranean, sheltered from the strong north winds and safe for all types of boats. After Barcelona, it is the second port in Catalonia for cruise ship passenger transit. The port has a privileged location, ideally suited for cruise ships on account of its proximity to the waterfront town of Palamós with its shopping streets and delectable gastronomy. Palamós has developed from the original seafaring village into a lively, modern town, situated only an hour away from Barcelona and very near the main tourist attractions of Girona province. The port of Palamós is associate member from Medcruise and member of its Board of Directors. North (N) and north-west (NW) component winds, with north-east (NE) and south-west (SW) winds predominating in summer. 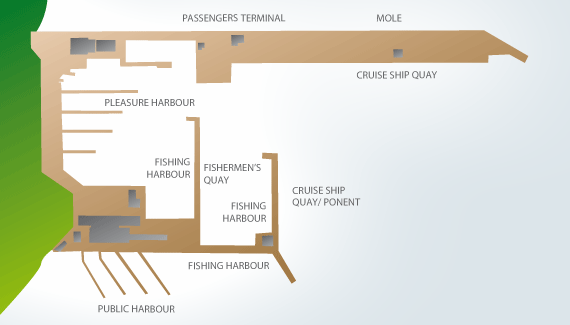 386 metres of berthing line, 43 metres wide, 2 metres above sea level, 14 metres draught. No LOA restrictions. Mooring bollards and Front Panel fenders 22.5 m. apart. 150 metres of berthing line, 6 metres wide, 1,5 metres above sea level, 7 metres draught. Front Panel Fenders and bollards. The new Palamós harbour station is a 182-m2 building comprising a police control and surveillance office, security systems, passenger waiting rooms, tourist office and other areas. Security check control is applied on cruise terminal. Passengers and crew are required to carry identification with them if they leave the ship and will be subject to search by shore side security personnel. ATM machines: Available on town. 0,5 metres far away. Ports de la Generalitat is a company certified by ISO 9001, ISO 14001 and EMAS.